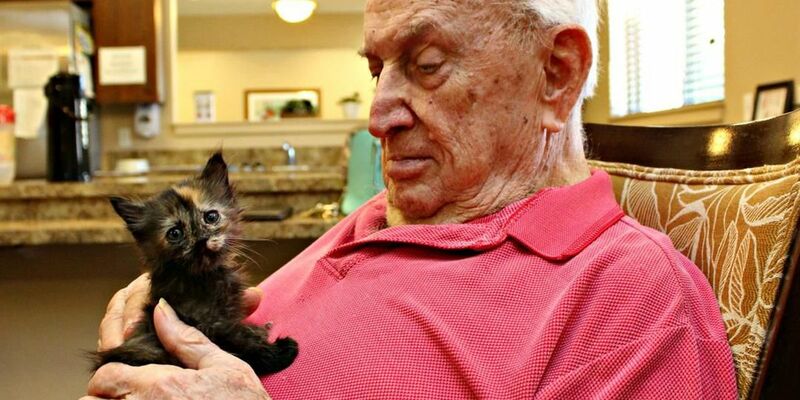 ORO VALLEY, AZ (Tucson News Now) - A new program is enriching the lives of both the elderly and orphaned kittens. In their last fiscal year, the Pima Animal Care Center took in more than 2,100 kittens, many just days old and in need of around-the-clock bottle feeding to survive, according to a press release. Now PACC is partnering with Catalina Springs Memory Care in Oro Valley to save the kittens' lives, and enrich the lives of the residents who live there. Residents will provide the bottle feeding, socialization and the love the kittens need to thrive. "To some, it may seem peculiar at first: Residents who are in need of around-the-clock care themselves, given the task to care for these young kittens," said Catalina Springs Memory Care Executive Director Sharon Mercer in the press release. "But there are skills, emotions and needs that do not just leave a person with Dementia or Alzheimer's. The desire to give love and receive love remains. The kittens have given us the opportunity to nurture this human condition that lies in each and every one of our residents." The first two kittens to go through the program were brought to PACC as strays on Oct. 14. They weighed just 7 ounces, but are now healthy and will soon be ready for adoption. The two stopped by Fox 11 Daybreak on Nov. 1.